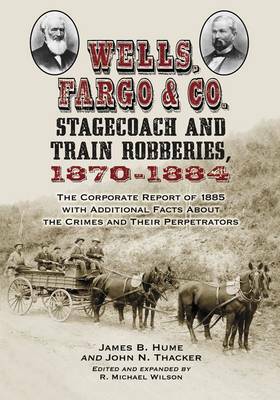 In January 1, 1885, Wells, Fargo & Company's chief detective James B. Hume and special agent John N. Thacker published a report summarizing the company's losses during the previous 14 years. It listed 313 stagecoach robberies, 23 burglaries, and four train robberies but included little or no details of the events themselves, focusing instead on physical descriptions of the robbers. Widely circulated, the report was intended to assist law enforcement in identifying and apprehending the criminals believed still to present a danger to the company. The present volume revisits each crime, updating Hume and Thacker's original report with rich new details culled from local newspapers, personal diary entries, and court records.